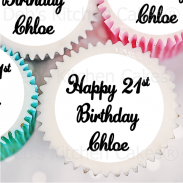 Whether you are looking to personalise a cake with your own photo and message or want to make an impression with your business logo we have a cake topper to suit. 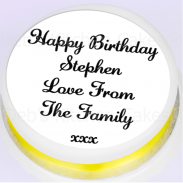 This is a simple yet hugely effective way to make an impact with your cake. Whatever your level of experience in cake making and decorating you'll find our toppers easy to use and apply. We can use any kind of image and we'll add any message for you.